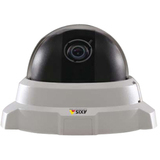 AXIS P3301 Fixed Dome Network Camera is designed for indoor environments where discreet and compact solutions are required. Offering superior video quality in multiple, efficiently compressed H.264 streams, they constitute the perfect solution for video surveillance systems with tough quality and efficiency requirements, e.g. in retail stores, schools, prisons, banks and airports.